I see in the instructions where it says that fonts that start with the "@" are vertical, but I do not see any that start with that symbol. I am trying to fill in text inside of a box but can't seem to figure it out. 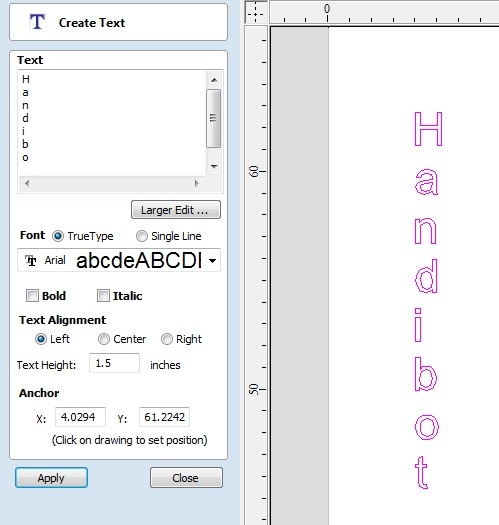 To fill text inside a shape--you have to make select the vector shape in which you want to place the text before pushing the "draw text-within a vector box" button. As for vertical text...I don't have an @ symbol fonts in my software either. Though in their example the text is just rotated 90 degrees--which you could do with the rotation tool. If you want the text to be arranged vertically with all the characters upright, you can draw a vertical line, select the "text on a curve" function and check the box for "keep text vertical". Also you could hit return after each character and use center justified. almost the moment after I submitted that I found the "@" symbols were in the regular text area but not the "fill in the vector/box" option. I was wanting the letters to stay horozontal and just go down instead of across but have not figured that out yet. and then two mins after I posted that I figured out the vertical writing. Well kinda.... I can't get it to do it with out overlapping a few letters. Have you tried hitting the Enter key after each letter as you're entering the text? > tter as you're entering the text? Yes that does work. Not sure why I didn't think about it thanks again.